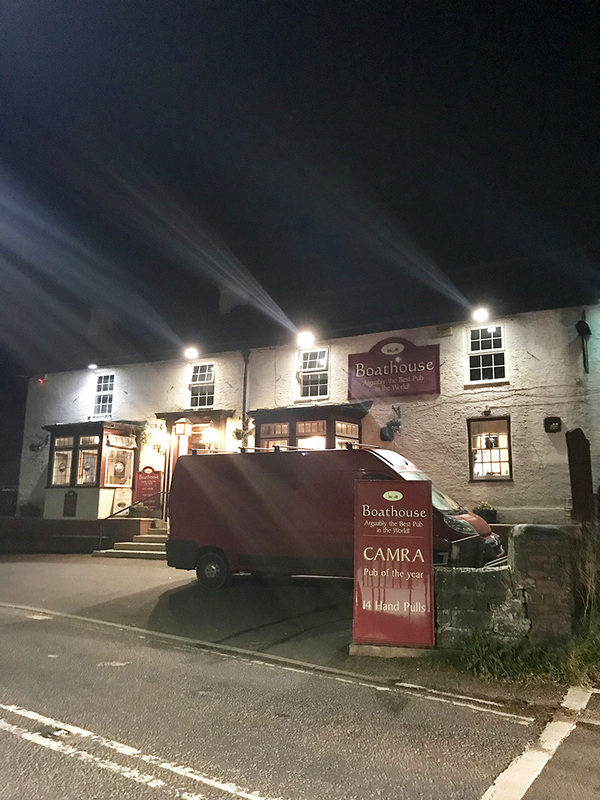 Of all the unpredictable details of our anniversary trip – the pleasant weather, the ease in which we navigated the roads, the picture-perfect half marathon despite my doubt – the best unexpected part of our trip was making fast friends with a couple from Newcastle at a pub near our Airbnb in Horsley. Our stay in Northumberland was brief since it was a one-night stop on our way to Scotland. 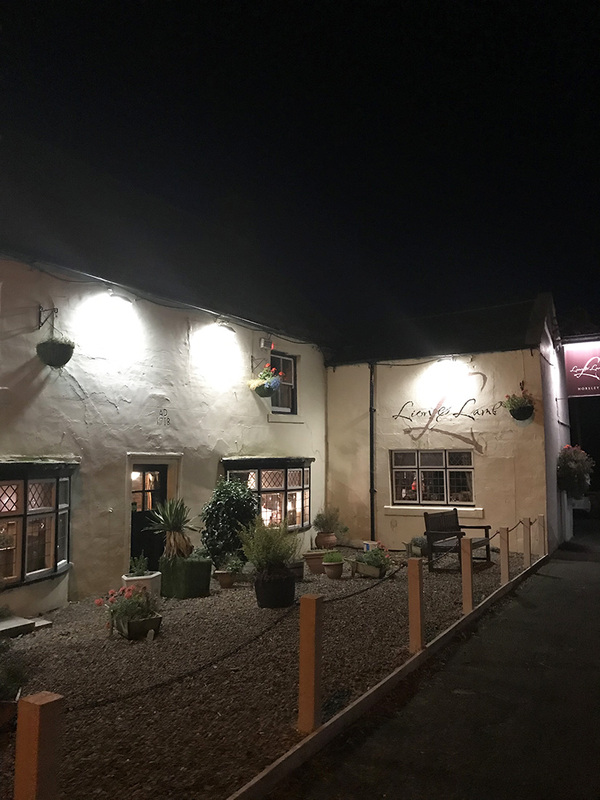 Horsley, the tiny spot of a town west of Newcastle, offered a cozy spot to sleep and a pub – The Lion and Lamb – within walking distance. We were tired from our busy morning in Oxford and the Cotswolds, not to mention the near-five hour drive afterward. All we had in mind was a hot dinner and a few pints. We settled at a table and ordered. Across the tiny room was another couple and their little brown dog. 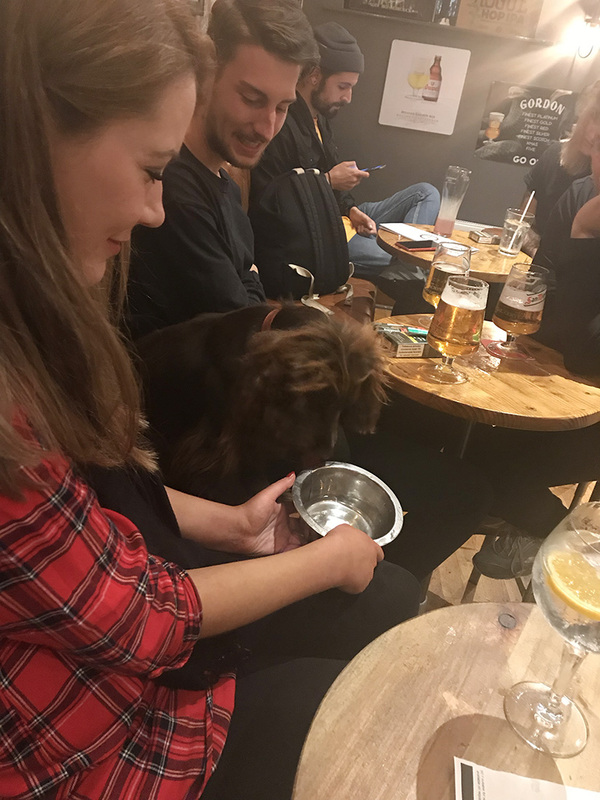 (Note: I love that so many European restaurants let in well-behaved dogs.) Of course, I had to make eyes with the pup because I have no self-control. Aware of one another, we smiled and nodded to the humans. But really, I was eye-balling that dog. Eventually, I got up to pet him. Thus began our conversation with Becca and Luke. The usual questions started – Where were we from? What were we doing in the area? Were we enjoying ourselves? Did you know you sound like Julia Roberts? They were locals, so I returned as many questions as I could. What was worth seeing in the area? What’s it like living here? Why is Northumberland so perfect? Then they had an idea – what if they gave us a quick tour by car? Sure, it was dark, and yes, we were strangers, and of course, this sounds totally bizarre. But how about it? Sure! 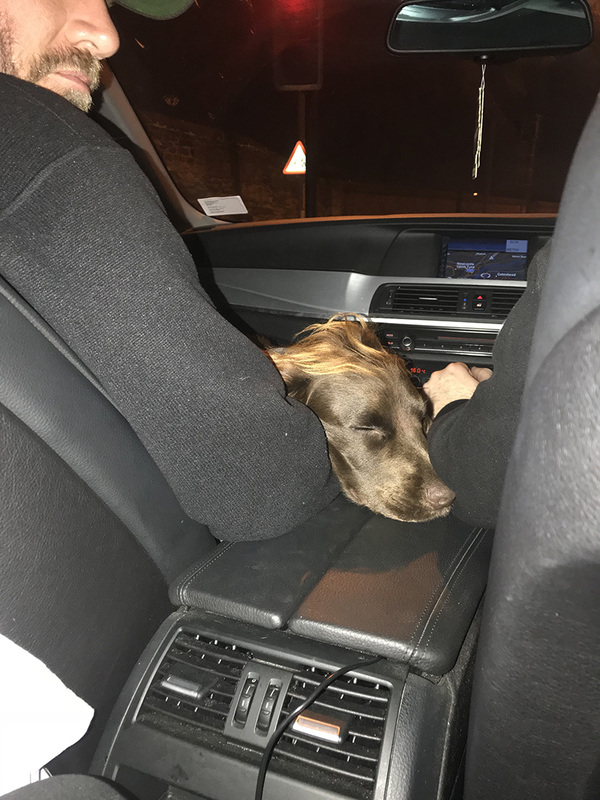 We piled in Luke’s car – Ted the Spaniel jumped in Chuck’s lap, while Becca and I sat wedged in the back seat. Off we went to The Boathouse on the River Tyne. Our night didn’t end at The Boathouse. Shall we go into Newcastle and visit another pub? OF COURSE WE SHALL. Come on, Ted. 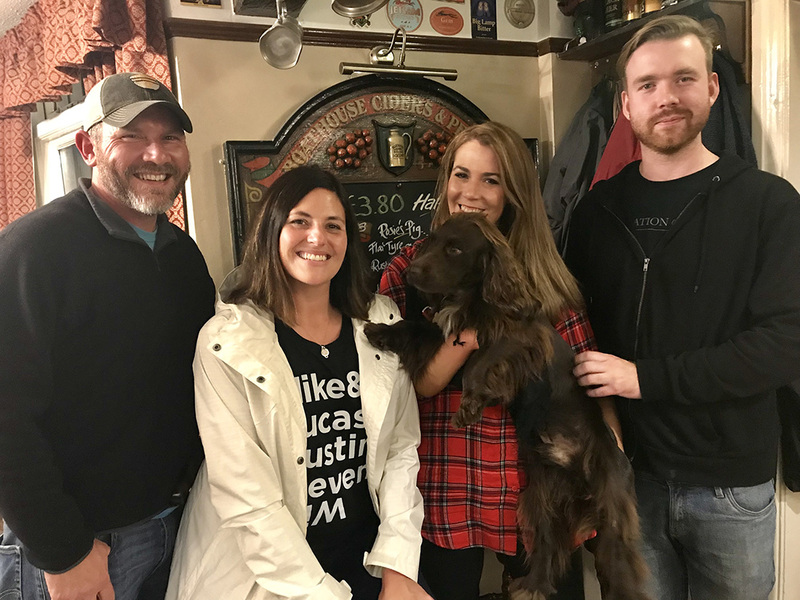 I can’t remember the name of the third pub we visited, but there we met another group of locals who enjoyed Ted’s company as much as we did. Our conversations circled every topic imaginable, from what we all did for a living, a little of our histories, whether or not we were Trump supporters, whether or not they were Brexit supporters, and so on. At every turn, I found them more interesting, more enjoyable to be around, and I grew more thankful we said yes back at the Lion and Lamb. 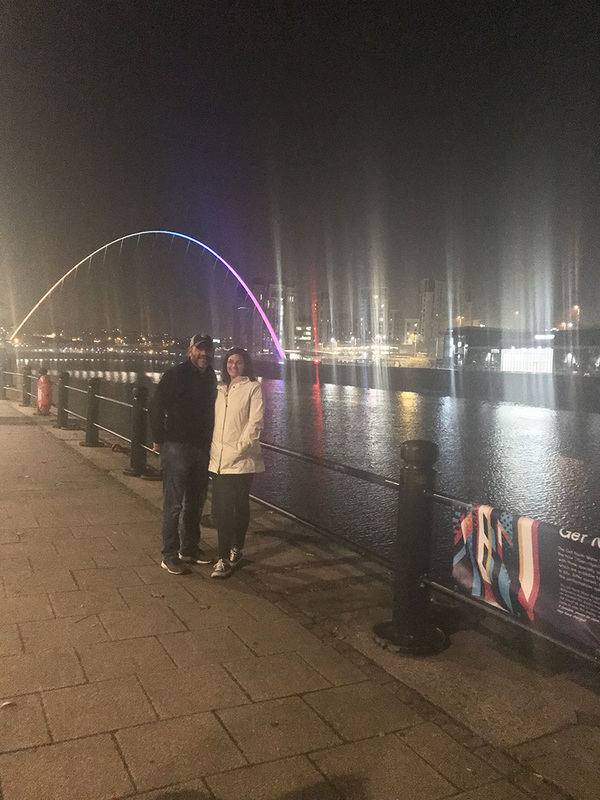 At the close of the night, Luke and Becca took us for a quick walk by the riverside and it was there that we realized how similar Newcastle is to Knoxville. Totally unexpected but completely worth it, we will never forget our one night in Newcastle and the sweet people who made it memorable for us. Becca and Luke, please come to East Tennessee so we can return the favor.